Dundee United manager Jackie McNamara is delighted to be at the top of the Premiership and reckons there is still room for improvement. 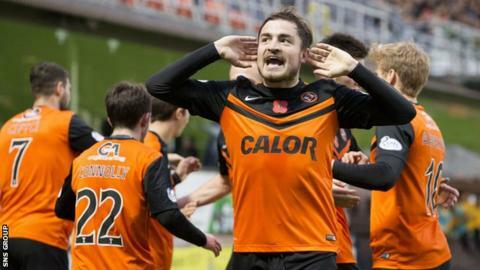 A 3-0 triumph over St Mirren ensured United remain unbeaten at Tannadice this season. "When we're on song, I'm confident we can beat anyone." St Mirren created the better openings in the first half but Paul Paton found the net on 45 minutes to give the hosts a platform to build from. "I thought we were very fortunate to be 1-0 up at half time," admitted McNamara. "Rado (Radoslaw Cierzniak) has made a good save in the first half and another one early in the second half. "We got the breaks at good times today. We had opportunities to get a few more goals as the game opened up but we had to work hard to get there." McNamara made six alterations to his starting line-up after Wednesday's League Cup quarter-final win over Hibernian, which went to a penalty shoot-out after extra-time. "Wednesday took a lot out of the lads and I knew St Mirren would be fired up, so we had to match them." "I've got great faith in the squad," added McNamara. "We made a few changes to freshen things up and it worked well for us. "Wednesday took a lot out of the lads and I knew St Mirren would be fired up, so we had to match them. "It was a massive difference from last Saturday when we lost away to Inverness. "There's always room for improvement and that's we will be trying to do."